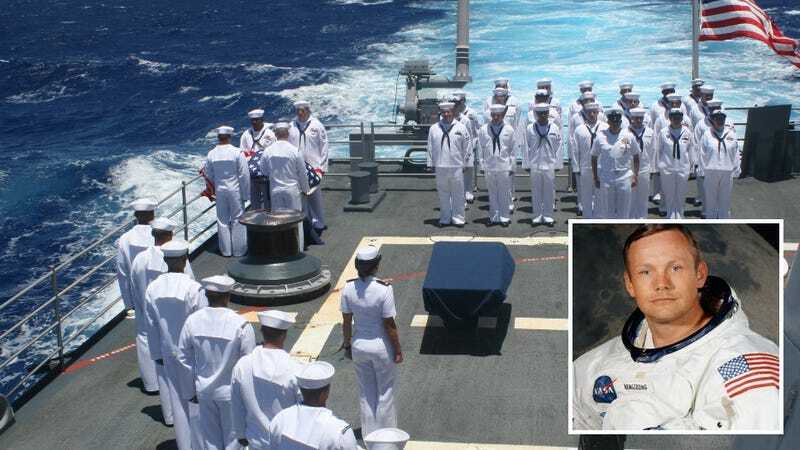 Neil Armstrong, America's greatest and most reluctant hero, is not going to have a grave. He's going to be buried at sea. Armstrong was a Lieutenant in the US Navy reserve. He originally joined the Navy in 1949, training at the Naval Air Station Pensacola and becoming a pilot. He flew 78 missions in the Korean War—a total of 121 hours in combat. He left the Navy to complete his space engineering degree and master, and then joined NASA. But he always remained a US Navy man. Perhaps that's the reason why he chose to be buried at sea. Or perhaps it's because he was such a humble and private man. According to Secretary of the Navy Ray Mabus "he never wanted to be a living memorial, and yet to generations the world over his epic courage and quiet humility stands as the best of all examples."